Stover had 175 tackles including 11 for loss, one sack, two forced fumbles, four interceptions and nine pass break ups in 2018. 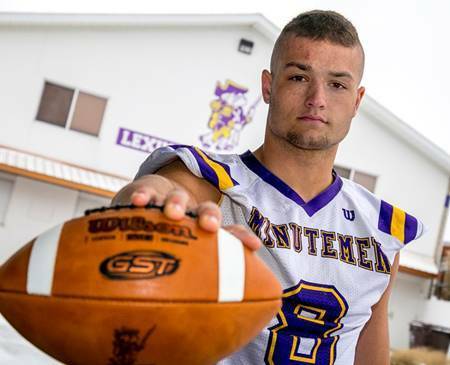 LEXINGTON, Ohio – Lexington senior Cade Stover never usually signs his name with a prefix. Now he can. Call him: Mr. Football Cade Stover. On Wednesday, the Ohio High School Athletic Association in coordination with the Ohio Prep Sports Writers Association announced Stover as Ohio’s 32nd Mr. Football for the 2018 high school football season. Stover may not have the words to describe why he is Mr. Football, but his play on the field this season did the talking for him. He led Lexington to a 7-4 record which included a playoff win over Tiffin Columbian. He led his team with 175 tackles including 11 for loss, one sack, two forced fumbles, four interceptions and nine pass break ups He finishes his career at Lexington with 592 total tackles, 21 tackles for loss, four sacks, eight interceptions, six forced fumbles, four fumble recoveries and 24 pass breakups as he lined up all over the field in his safety-hybrid position. Stover didn’t just do it all on defense, he was an offensive force in 2018 as well tallying 1,497 rushing yards on 205 carries going for 18 touchdowns. He also had 21 catches for 238 yards and a score. During just his senior season, Stover was named 2018 Mansfield News Journal Defensive Player of the Year, Division III All-Ohio Defensive Player of the Year, Ohio Prep Sports Writers Division III Northwest District Defensive Player of the Year, North Central Ohio Football Coaches Association Defensive Skill Player of the Year and Ohio Cardinal Conference Defensive Player of the Year. With the 2018 Mr. Football award at home in Lexington belonging to Cade Stover, the kid with a long list of awards admits this one is sweetest. Other finalists for the award included CJ Charleston of Gates Mills Gilmour Academy, Brady Blattner of Byesville Meadowbrook, KJ Price of London, Ethan Heller of Thornville Sheridan, Miyan Williams of Cincinnati Winton Woods, Jamir Thomas of Massillon Washington and Mark Waid of Girard. Quarterbacks: Trevor Bycznski, Berea-Midpark, 6-5, 230, sr.; Griffin Veil, Hilliard Bradley, 6-1, 180, sr.; Alijah Curtis, Canton McKinley, 5-9, 184, sr. Running backs: JuTahn McClain, Fairfield, 5-10, 180, jr.; Jesse Deglow, Kettering Fairmont, 5-10, 194, sr.; Brian Trobel, Mentor, 5-8, 175, jr.; Lameir Garrett, Canton McKinley, 5-10, 191, jr. Receivers: Jack Duffer, Hilliard Bradley, 6-2, 180, sr.; Garrett Waite, Berea-Midpark, 5-10, 175, sr.; Jake Ryan, Massillon Jackson, 6-3, 170, jr.; Khyree Woody, Canton McKinley, 5-10, 168, sr.; Chris Scott, Pickerington North, 6-3, 186, jr. Linemen: Paris Johnson, Cincinnati St. Xavier, 6-7, 287, jr.; Darrius Johnson, Euclid, 6-4, 320, sr.; Ryan Jacoby, Mentor, 6-5, 275, sr.; Cam Craig, Dublin Jerome, 6-5, 280, sr.; Alex Azusenis, Powell Olentangy Liberty, 6-5, 295, sr.; J.D. Duplain, Strongsville, 6-5, 310, sr.; Isaiah Gibson, Springfield, 6-4, 294, sr. Kicker: Charlie Sipe, Mason, 6-2, 210, sr.
Linemen: Jay Amburgey, Reynoldsburg, 6-5, 286, sr.; Jasiyah Robinson, Groveport Madison, 6-3, 225, jr.; Jack Sawyer, Pickerington North, 6-4, 217, so. ; Zach McMahan, Cleveland St. Ignatius, 6-0, 250, sr.; Spencer Bono, Cincinnati Elder, 6-4, 240, sr. Jamie Hessing, Powell Olentangy Liberty, 6-0, 235, sr. Linebackers: Nick Wile, Hilliard Darby, 5-11, 195, sr.; David Williams, Gahanna Lincoln, 5-10, 185, sr.; Nick Fisanick, Upper Arlington, 6-0, 215, sr.; Jalyn Jacobs, Euclid, 6-3, 200, sr.; Jeff Barnett, Solon, 6-2, 200, sr.; Noah Smith, Dublin Coffman, 5-9, 210, sr. Backs: Patrick Day, Hilliard Bradley, 5-11, 170, sr.; Anthony Lowe, Grove City Central Crossing, 5-10, 175, jr.; Bobby Lindsey, Brunswick, 6-0, 180, sr.; PaSean Wimberly, 5-9, 165, sr; Syncere Jones, Cincinnati Colerain, 6-1, 185, sr. Punter: Trey Wright, Massillon Jackson, 5-10, 175, sr.